The MultiPhaseCavitator Insert (InsertMPC48) is designed to improve the ultrasonic processing of liquid/liquid or liquid/gas mixes. 48 very fine cannulas inject liquid or gas into a liquid phase right in the cavitation zone. This creates very small suspended droplets or gas bubbles yielding a very high specific surface area. This insert is particularly useful for emulsion chemistry, such as Phase-Transfer-Reactions, Phase-Transfer-Catalysis (PTC) or Liquid-Liquid-Extraction. Another interesting field of application is the precipitation of particles from two liquid precursors or sono-crystallization. 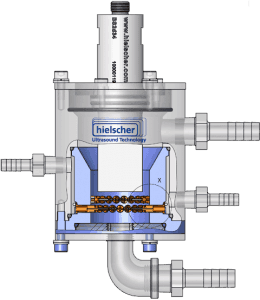 This insert is designed for Hielscher flow cell reactors and allows for batch or continuous processing. Ultrasonication is an effective means for emulsification and mixing. Different from the conventional setup, where separate phases are combined before they enter the flow cell and the cavitation, this flow cell insert improves the combination of the two phases. When a liquid is injected through the 48 fine cannulas, it enters the flow cell in very narrow strands. The insert uses very 48 fine medical cannulas with inner diameters from 0.3mm to 1.2mm. These cannulas can be easily replaced and are a low cost consumable (sterile, approx. 2ct/pc). The ultrasonic cavitation (at 20kHz) cuts the 48 incoming liquid strands into small droplets when they enter the liquid phase in the flow cell. The design applies the same feed pressure from one supply to all 48 cannulas to level the flow between the cannulas. 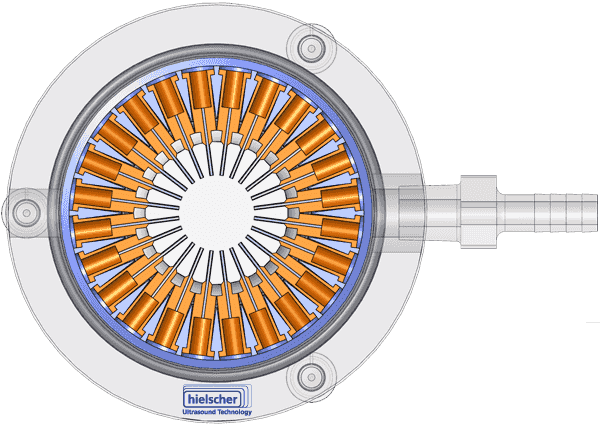 Hielscher ultrasonic reactors are often used to emulsify, to improve phase-transfer process kinetics or dissolving rates in liquid-liquid phase systems. Examples for such processes are the oxidative desulfurization with hydrogen peroxide and subsequent solvent extraction or the base-catalyzed transesterification of triglycerides. Limited solubility of one reagent phase in another reagent phase is a significant problem in the process emulsion chemistry as both phases react with each other only at the interphase. Without ultrasonics, this results in low reaction rates and a slow conversion kinetics in two-phase systems. Using the insert with an ultrasonic reactor, the cavitation produces high hydraulic shear and breaks the injected phase into sub-micron and nanosize droplets. As the specific surface area of the phase boundary is influential for the chemical rate of reaction this significant reduction in droplet diameter improves the reaction kinetics and may reduce or eliminate the need for phase-transfer agents. The volume percentage of the injected phase may be lowered, because finer emulsions need less volume to provide the same contact surface with the other reagent phase. The use of this insert may lower the required amount of amphiphilic emulsion catalysts or phase-transfer catalysts (PTC), such as quaternary ammonium salts with their unique capability to dissolve in both aqueous and organic liquids. When two reagent phases react at a phase boundary, the reaction products accumulate at the droplet surface and block the reagent phases from interacting at the interface. The hydraulic shear caused by the ultrasonic cavitation results in turbulent flow and material transport from and to droplet surfaces and leads to the repeated coalescence and subsequent formation of new droplets. As the reaction progresses over time, sonication maximizes the exposure and interaction of the reagents. This effect is used in many processes, such as the transesterification of vegetable oils to biodiesel or the synthesis of polyesters by the transesterification of diesters with diols to form macromolecules. This flow cell insert improves the emulsification when mixing immiscible liquids. This leads to smaller droplet sizes and a narrower size distribution – key factor for the stability of an emulsion. With this design you can inject and emulsify low and medium viscosity liquids into even high viscosity liquids, such as heavy fuel oils (HFOs), polymers or gels. Some formulations may require emulsifiers or stabilizers to be added. In this case it helps to mix the emulsifier uniformly. Customized designs for the injection of more than one phase though the cannulas are available on request. This insert boosts liquid-liquid extraction processes by making a fine-size turbulent emulsion, e.g. of a solvent phase in a oil phase. Again, this increases the phase contact surface and results in better extraction and reduced solvent usage. Low grade fuel oils, such as heavy fuel oil used on marine vessels or for power generation can be emulsified with water. This results in a more efficient combustion and in a significant reduction of NOx emissions and soot. Read more about ultrasonic emulsification of aqua-fuels (emulsion-fuels)! Better design creates better results! Pigments or nano-particles can be generated bottom-up by precipitation in liquids. In this case, a supersaturated mixture starts forming solid particles or crystals out of the highly concentrated material. These particles will grow to a certain point and finally precipitate. In order to control the particle/crystal size and morphology, controlling the precursor/reagent mixing is essential. In general, the precipitation process involves: Mixing, supersaturation, nucleation, particle growth, and agglomeration. The latter is avoided by a low solid concentration or by stabilizing agents. The mixing is critical; as for most precipitation processes the speed of the reaction is very high. The InsertMPC48 combines fast narrow injected jets with strong ultrasonic cavitational shear. This maximizes the mixing speed and performance creating more and smaller particles. Particle size distribution of Fe3O4 (magnetite) particles generated in an continuous ultrasonic precipitation reaction (Banert et al., 2004). 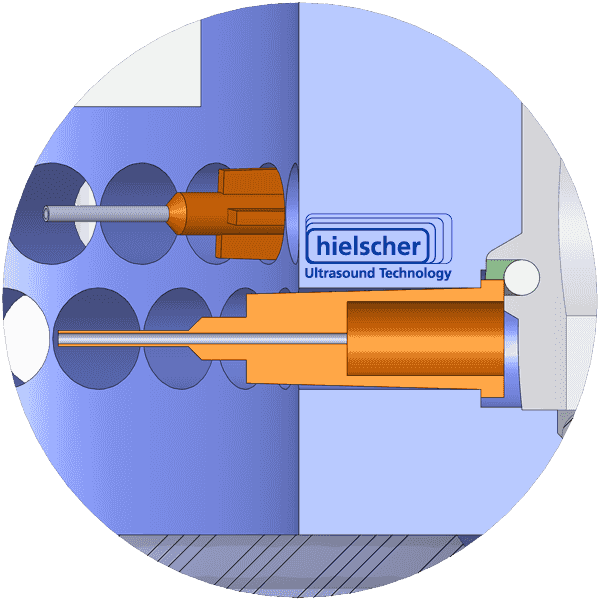 Hielscher Ultrasonics offers equipment to test, verify and utilize this technology at any scale. The concept is easy to incorporate into existing processes. At bench-top level a UIP1000hd (1kW) can process flow rates from 100 to 1000L/hr (25 to 250 gal/hr) for process demonstration and for the optimization of the sonication parameters. 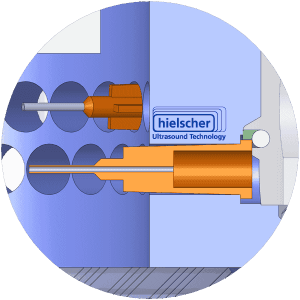 Hielscher ultrasonic processors are designed for linear scale-up to larger processing volumes at pilot or production scale. The table below lists processing volumes and recommended equipment sizes.